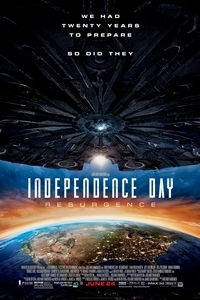 Independence Day — a resurgence? The saucers are even bigger. Twenty years ago, my new wife and I stood in line for what seemed like hours at Horton Plaza to see Independence Day. Why? Because of those fantastic teasers that showed the shadow of a gargantuan flying saucer slowly crawling across various familiar landmarks: Manhattan Island, the Washington Mall, etc. Even Reader ur-critic Duncan Shepherd took note, writing in his two-star review: “Film, as we’ve all been instructed but haven’t all yet learned, is a visual medium, and the scale of these alien spacecraft (dwarfing the twinkling Christmas decoration at the end of Close Encounters of the Third Kind) in relation to the stubby Manhattan skyscrapers and the gnatlike Marine Corps fighter jets is something quite new. (The only thing close to it in terms of jaw-dropping awe is perhaps the nebulous menace advancing toward Earth in the original Star Trek, a much better movie, incidentally, as measured in its ability to complement the awe with elements like suspense, mystification, curiosity, surprise. )” Not that I read his review before planting myself in line: this here was an event, and look who bought the myth. Now I’m older, but a fat lot of good it will do me: the sequel, Independence Day: Resurgence isn’t screening for critics. But the trailers have made it pretty clear that Emmerich is sticking with the old formula of “more of the same, but more.” In other words, this time, the saucers are even bigger. See you in line? June 22, 2016 @ 3:12 p.m. Even the always-interesting Jeff Goldblum [now the apartments.com guy] won't make me line up for this one. June 22, 2016 @ 4:03 p.m.
Goldblum is great in Le Week-End. June 22, 2016 @ 6:07 p.m. I enjoyed him in "The Grand Budapest Hotel." And it only lasted seven episodes, but his 2007 TV series "Raines" was simply superb; Goldblum at his best! I was so $%^%#$& upset that it was cancelled so soon. June 22, 2016 @ 4:16 p.m.